The gibbon monkey -- or, more properly, gibbon ape -- might not have a familiar name, but you've probably seen his funny walk and graceful style of swinging through the trees. Gibbons are so closely related to humans that they live in monogamous families and can walk upright on two legs. These slender, agile primates live in a small part of the world and are on the endangered species list. Gibbon monkeys aren't actually monkeys, but instead belong to the Hylobatidae family, also known as lesser apes. Because gibbons resemble their non-ape primate relatives, they are often called monkeys. National Geographic recognizes 15 species of gibbons, while the United States National Zoo lists 12 species of gibbons. The Ape Taxon Advisory Group states that 16 or 17 species of gibbons exist. 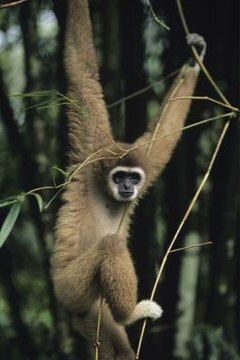 All gibbons are smaller than great apes, usually standing only 3 feet tall and weighing an average of 10 to 20 pounds. The largest gibbon species, the siamang, can weigh up to 30 pounds. Gibbons are long and slender with bushy hair and no tails. Gibbons live in the rainforests of southeast Asia, including India, China, Laos, Vietnam, Indonesia, Sumatra, Burma and Borneo. Gibbons spend most of their lives in the trees, where their bodies are especially suited for tree-top living. Their arms are longer than their legs, and their shoulders have a wider range of motion than most animals. They also have long fingers that cup the branches as they swing through the trees in a motion called brachiation. Using this type of swinging from limb to limb, gibbons can travel as fast as 35 miles per hour and cover gaps between limbs up to 50 feet. Gibbons will occasionally descend to the ground, where they are surprisingly good walkers. They will usually hold their arms above their heads, which keeps their hands from dragging the ground and helps with balance. Gibbons are monogamous apes and live in small family groups. The female is the dominant member of the primate couple, followed by her offspring, and finally, the male at the bottom of the ladder. The family group stakes out a territory in the trees and the forest floor below and will defend its home against other gibbons, as well as other types of intruders. A female gibbon will have a single baby every 2 to 3 years. Young gibbons stay with their parents for years, as they don't reach maturity until 6 to 8 years of age. As a result, a family group may consist of the parents and up to four young gibbons. Gibbons are omnivores, but eat mostly the abundant fruits in the rainforests, especially their favorite fruit, the fig. Usually, fresh fruit makes up 75 percent of the gibbons' diets. Gibbons often supplement their diet with fresh leaves, plant shoots, seeds and flowers. As omnivores, gibbons will occasionally eat insects, bird eggs and even small birds.